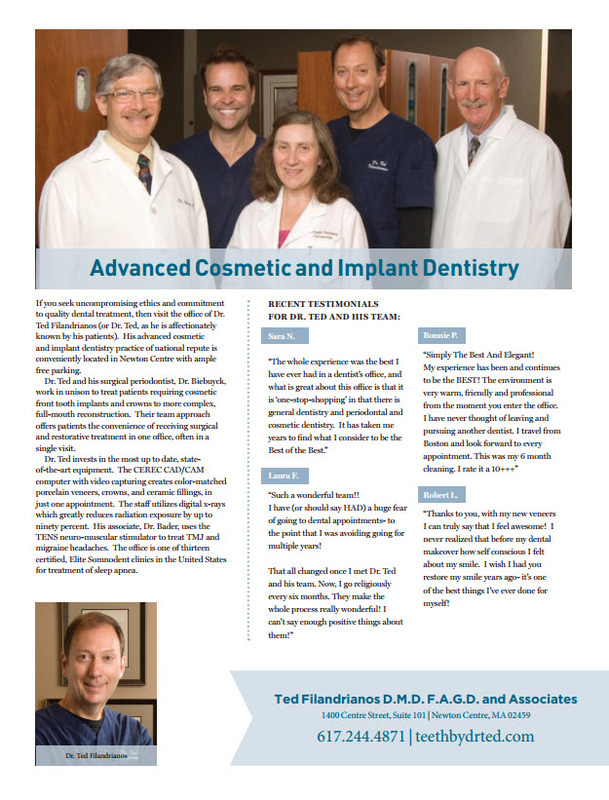 Please take a moment to review some of the testimonials provided by patients of our Boston area cosmetic & dental implant office. Please contact our office if you have any questions or have a testimonial you would like to share with our patients and website visitors. Click here to schedule your appointment online. Click below to read what our patients have to say! I wish there were a Yelp "location" category called "The Universe"...because Dr. Ted Filandrianos and the outstanding dental team in his Newton Centre office are the absolute BEST in the Universe. I should know. I've had it all there...cleanings, fillings, root canals, extractions, bone grafts, implants, crowns...and every single treatment was performed impeccably...and as an added treat, with chair-side manners that make you feel relaxed, anxiety-free and...dare I write this about a dental experience?...well-loved! Dr. Ted and his colleagues will do everything they possibly can to save a tooth. And when they can't, these brilliant, topnotch specialists will spring into action with their specialties...and save the day! Dr. Ted has saved or restored so many of my teeth. He is the perfect blend of scientist and artist and his work is second to one. Add to that the warmest and most empathetic treatment I've ever received from a dentist (I used to dread the dentist!) and you have, as I said, the best dentist in the Universe. I also want to say that if you ever, ever need a dental implant, and I needed two...and a bone graft...right after an extraction of an infected tooth...and you are nervous about it...periodontist Dr. Jean-Marie Biebuyck aka "Dr. B" will remove that anxiety when he puts his talents to work. I could not believe it. He calmed me, he assured me that all was going well, he made me laugh a few times and, most importantly, he was visibly proud of how well each procedure turned out and put me at ease each step of the way. And how about those dreaded root canal treatments? Not here. Just this past weekend, I was in horrific pain from an infected lateral incisor (top). Dr. Ted put me in touch with my now-hero Dr. Barry Goldberg, the endontist in his office - and Dr. Goldberg called me and put me on an antibiotic immediately (on a Sunday!) so that I'd be prepared for the next day's root canal appointment. His chair-side manner is exceptional as well...and he put me at ease from "hello". I love how he explains what's going on with the tooth while we look together at the x-rays - and the steps he is going to take. Even the way he administers Novocaine is a pleasant experience if you can believe that. I just went back yesterday so Dr. Goldberg could fill the canals and put a temporary filling - and everything went perfectly. No more pain - and he saved my porcelain crown...he was so careful when working on it! Next step - permanent filling with Dr. Ted. I could go on and on (which I already have!) but I also need to mention that Zuzana is an outstanding dental hygienist who knows I can act like a 3-year old baby when it comes to the probing during a cleaning - and she makes it as painless as possible with her talent and skill. And the dental assistants (I apologize for not remembering all the names from the past several years) are wonderful...topnotch...and a huge component of the overall positive experience I've had in Dr. Ted's office...so I want to thank Marina and Wendy for being the best and taking good care of me. Now...last but in no way least...I need to give a shout out to the very professional and vibrant Emily and Ali who are at the front desks - and who help ensure that Dr. Ted's practice runs smoothly. Whether it's a phone or in-person conversation, you will feel like the only patient in the practice...because of how Emily and Ali greet you, treat you, listen to you and reassure you that you are in the best dental office...in the Universe! Dr. Ted struck gold when he found them! But don't take my word for any of the above. Experience it yourself - and you'll see what I mean! I have (or should say HAD) a huge fear of going to dental appointments- to the point that I was avoiding going for multiple years! That all changed once I met Dr. Ted and his team. Now, I go religiously every six months. They make the whole process really wonderful! I can't say enough positive things about them! Simply The Best And Elegant! So very glad I changed dental practices. I love everyone that I deal with here. I haven't felt so comfortable with a dentist in many years. Even though I have to travel from Framingham I am very glad to do so. Great! Seen right away, office on time and prompt. No one ever says that about a Dentist's office but in this case it's so true. From the moment you walk in, friendliness, punctuality,professionalism,and caring! The office is clean, efficient and everyone is courteous! Wow! I'm definitely coming back. I have a deep hatred for needles and pain. I got a filling done by Dr. Filandrianos after part of it felt out from a previous dentist. I felt nothing. In fact, when he said he was done, I wanted to give him a hug. He makes going to the dentist a pleasant experience. Dr. Filandrianos and his entire staff offer extremely professional and caring service and have done so for my family for many years. I've been a patient of Dr Ted and his practice for over a decade. The kind and thorough dental care is consistantly great and I know the staff always has my best interest in mind. I cant imagine going anywhere else - it feels like family. One visit and you'll be hooked! I had a root canal with Barry Goldberg today and was a tad nervous as it was my first one. Barry explained things well and did a terrific job. I was impressed with everyone at this office. I started with Dr. Ted's practice before Dr. Ted became a partner. I was satisfied then and am still very satisfied. Dr. Ted has not only taken care of routine dental needs, he has restructured my teeth and given me a very complimentary smile. Highly recommend him and his staff. 1/2/15--Karen Agnew--I have always been extremely happy with all my dental services that I have received from this office. I love the work that Dr. Ted does. I love that I never have to wait more than a few minutes to be seen. The people who work there are always nice and friendly! I have always been grateful that Dr. B introduced me to Dr. Ted! Dr. Ted and Dr. B are the best!! I am not comfortable going to the dentist. The staff and doctor made me feel very comfortable. Thank you for your patience with me. Excellent, professional and timely service! As always, from the moment I walked in the door I was made to feel very comfortable! Zuzanna did her usual amazing job cleaning my teeth. She is so talented!..Very professional and extremely kind! She takes great care in doing a very thorough job, without ever having me in any discomfort whatsoever. Dr Ted is great! He thoroughly checks everything and even made the time to make me a night-guard at that very same visit. Truly wonderful service delivered in a very personal and caring way. Thank you! You turn a scary situation into a great and fun experience! Seeing all of you is a highlight of my life. Everyone is so warm and friendly and I leave feeling so good. You have, miraculously, given me great teeth which I never had in my life. What should be a difficult situation ends up being wonderful because of the kindness and warmth you extend to everyone. Sometimes, I just want to take you all home with me. Christine, dental hygienist, is absolutely terrific! I look forward to my dental cleanings every 6 months! Christine is always professional, makes one feel comfortable and relaxed during the treatment and she is an extremely skilled and thorough hygienist! Prompt, excellent service. Christine is very thorough,but gentle. Dr. Ted always checks my teeth after the cleaning. X-rays were done very efficiently. The office is super clean which is very important to me. Going to Dr. Ted's office is like visiting a favorite friend. They will take care of you and entertain you and make you feel all warm and fuzzy. Everyone in this office knows their stuff, will take utmost care of your teeth and will not overcharge you for services or try to push unnecessary procedures. It's always a pleasure----Dr Ted and his Associates are delightful---plus being THE best in their field ,one can go with complete confidence that your teeth are in excellent hands .The girls answering the phones are polite, helpful and charming.. I have recommended several friends who are equally as pleased. excellent quality work, service, attentiveness to patient, on time. I had a crown put on. Dr. Ted can do the whole procedure in 1 sitting. The crown is made in his office. I had a crown put on by Dr. Ted a couple of years ago as well. I have had no problems. Dr. Ted's work seems to be of very high quality. He seems to be very interested in providing high quality work for his patients and is very caring. He is very efficient. He and his staff are very pleasant. I love going to My Dentist! Wonderful people, they always make you feel welcome. This group is very professional and the office is beautiful. Dr. Ted is the best. His dental work is the best in town. I highly recommend him for any dental work,including fillings,implants or veneers. You will not be disappointed. P.S. The staff is top notch as well. I had a crown come off last night. I called this morning to have it reattached and was immediately given an appointment at lunch time and within 20 minutes, I was back to normal. My wife and I have been patients of Dr. Filandrianos for 20 years and have always been treated first class. I've been a patient here for 10+ years and I can honestly say that Dr. Ted is the best dentist I've ever had. Because of this I've referred many people over the years and everyone I've referred has made a point of thanking me and telling me how much they appreciate finally having a dentist that they feel comfortable with. His knowledge, experience and expertise are second to none. This holds true for the associates as well. If you're looking for an exceptionally skilled dentist that offers the most advanced care available, you won't find a better option than this. The office has a great feel, the people who work there are always upbeat and you can tell that everyone really enjoys their work. If you're looking for the best dentist out there, conclude your search here. You'll be very happy you did. He is really gentle and my daughter has had many extractions from other dentists - his hurt less and was quick and gentle. He really cares about his patients too. Outstanding dental care. Wonderful people. Couldn't ask for better. I have been seeing Dr Ted for about 11 years after listening to my father rave non-stop about how wonderful he was. I moved and still drive 35 minutes to see him for all my dental issues. At one point I tried to find a dentist more local to me but went back after one visit – Dr Ted is worth the drive and traffic! He is SO kind, gentle and completely eases any fears I have about my dental work. I mostly see Dr. Ted for standard cleanings but have had several cavities filled/repaired through the years as well as 2 caps and 1 route canal. I have never felt any excess pain or discomfort from these procedures. That is one of Dr. Ted's main concerns! The office is beautiful, the rooms are all bright and very comfortable and is in a great location with plenty of street and garage parking. The office staff is also wonderful to deal with. I would recomend Dr. to anyone looking for a dentist!! Exceptional, as always! All aspects of the practice. I was in for a routine follow-up today, and the experience was as positive as ever. Friendly greeting, appointment ran as scheduled, no hitches, inconveniences at all. I have been happy to refer friends to this practice. I Did Not Bite the Dentist! As always, came to the office this morning for some on-going repair work (having 2nd bridge installed), I was worried about the pain & suffering I may incur. Needless to say, hear I am writing a review - no pain or suffering - it's always in my head (no pun intended!)! Great team - including all office workers and they just keep getting better. The technology used in this office appears & "feels" to be the latest, up to date, pain free methods..... Very prompt service, never had to wait past my appointment time! I have been a regular and will keep it that way! I have a friend who had her teeth whitened and they look great so I decided to go in at her recommendation to have the ZOOM procedure. I am a person who is nervous at the Dentists and I met two Dentists, brother and sister, plud the staff--I had the Zoom procedure and everything went well and my teeth are shades lighter. I then came in for a cleaning and Dr Ted filled a cavity so quickly it surprised me. He explained that he was taking a picture of the area he had taken out to make my filling. Very high tech. The filling was also the color of my tooth, which was a new experience for me. I found the enviornment calming and the staff incredibly friendly. Y=The whole experience was the best I have ever had in a Dentist's pffice and what is great about the office is that it is "one stop shopping" in that there is general Dentistry and Periodontal Dentistry and Cosmetic Dentistry. I would recommend them to anyone. It has taken me years to find what I consider the Best of the Best for Dentistry. I have, in fact, recommend thos office to several friends who reported back to me their experience which is similar to my own. I want to thank you for my magnificent new smile! Patients tell me that after I restore their hair, they not only look better, but feel better, as well...they're right! Thanks to you-with my new veneers-I can truly say that I feel awesome! I never realized that before my dental make-over, how self-conscious I had felt about my smile. As with any cosmetic procedure, whether it is to restore ones hair or to re-do teeth, it is a big decision to get the nerve up to actually do something. We all procrastinate; we worry about the potential of pain; we are concerned about what others may think. Well, as my patients tell me abouit their hair restoration all of the time, I wish I had you restore my smile years ago. It was one of the best things that I have ever done for myself. Additionally, I want to compliment you with your selection and training of your staff for their professionalism and caring to make your patients feel welcome into your practice and -very importantly-feel comfortable throughout their visits to your office. Finally, thank you for your kindness, caring, and expertise-the Captain of the ship in your practice is actually an Admiral!